It wasn’t always clean, but Cloud9 is the NA LCS’ last team without a loss. 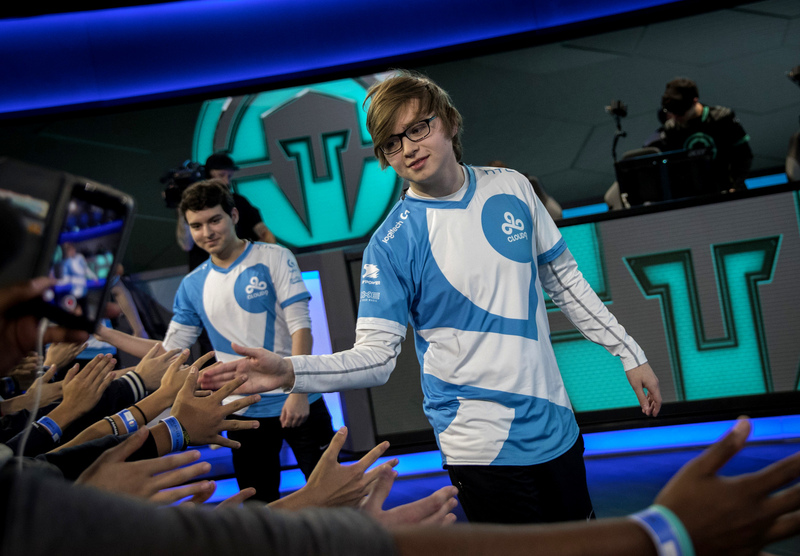 At the finish of week two in the North American League Championship Series, Cloud9 stands atop the league table as the lone undefeated team. Of course, they entered the day tied with FlyQuest, and with the latter slated to play a one-win Echo Fox team, we expected that tie to continue. But Echo Fox turned the tables on everyone. They used funky drafts to make FlyQuest uncomfortable, starting with a first-pick Camille in game one. Camille is universally known as extremely overpowered on the current patch (7.1), having been picked/banned in 100 percent of competitive games worldwide. FlyQuest thought they had a counter, picking Poppy immediately thereafter. And then Echo Fox pulled a rabbit out of their hat. It wasn’t a top lane Camille. It wasn’t a lane Camille at all. Instead, Austin “Gate” Yu took her at support. We’ve seen off-meta picks, but this is something else entirely. What has Gate been practicing? Does he even know what the word “meta” means? With the pocket pick in hand, Echo Fox went balls to the wall. They roamed as a team into FlyQuest’s jungle at level one and found mid laner Hai Lam all alone. Gate initiated with the insane range on Camille’s Hookshot, jungler Matthew “Akaadian” Higginbotham got the execution, and we all got a taste for how OP Camille support is. But Echo Fox have had early leads in several games that they failed to capitalize on. Fly Quest made their comeback but Echo Fox didn’t fold. They got fantastic performances from Gate and ADC Yuri “Keith” Jew, who have struggled this year. The Camille worked: she was effective long range engage for Jhin, who is most comfortable sniping from distance. FlyQuest took early control of game two (Keith really needs to improve his recall locations) to set up a deciding third game. it was a tense affair, with the two teams trading blows but neither able to take a convincing lead. FlyQuest consistently displayed better decision making as compared to Echo Fox’s risky, adventurous calls. Close games usually hinge on one late-game fight; all the shot calling in the world will not deliver victory if a team fails in that pivotal moment. That moment was in the Baron pit after FlyQuest took the objective. Echo Fox knew they needed to make something happen, and they fought beautifully. Top laner Jang “Looper” Hyeong-seok went in to cause chaos, and it was enough of a distraction for Akaadian to leap into the back line wearing Froggen’s Orianna ball. One Shockwave later, and Fly Quest was wiped. FlyQuest’s loss gave Cloud9 a shot at an undisputed first place ranking in the last match of the week. That match wasn’t easy, however. C9 withstood a spirited effort from CLG to remain undefeated. It initially looked like C9 would roll after winning game one and having all the momentum over a reeling CLG side. But CLG somehow found themselves with their backs against the wall. To be fair, Cloud9 made a bevy of mistakes, from not respecting CLG jungler Jake “Xmithie” Puchero’s presence on the map to a mechanical misplay from top laner Jung “Impact” Eon-yeong. But CLG turned a questionable draft and a desperate situation into a victory. Much-maligned (and improved) mid laner Choi “HuHi” Jae-hyun had a fantastic performance on an unfavorable matchup (Orianna into Azir) to even the series for CLG. CLG started game three with a ton of confidence, but one overstay at C9’s mid tier-two turret cost them dearly. C9 got four kills and the first Baron of the game off of that mistake, and with those resources, they set up a stubborn split push that slowly whittled away at CLG’s base. CLG would stall the game for a long time but in the end, they lost too many structures to C9’s pressure. There has been tremendous parity thus far in the NALCS. That makes Cloud9’s undefeated streak extremely impressive, even if it’s only week two. How long can they keep the good times rolling?